Professionals in the transportation database business voice a universal need for accurate road centerline data. The inaccuracy of current data — both geometry and attributes — is well known and documented. It impacts both the efficiency of current management and future scenarios such as ITS. This meeting brings together a small group (about 35) of public/private sector experts and academics. Over two days of presentations and demos, we shall explore and challenge the state of the art in the suite of technologies involved in deriving and maintaining road centerline files. Innovators will have a chance to interact with commercial software developers. The term “centerline” is used broadly — from a single-line representation of a complex highway, to centerlines representing each directional carriageway, multiple centerlines representing HOV and other carriageways, or lane centerlines. Work on detection/survey of kerb-lines/stripes and conversion to centerlines is welcome. The meeting is sponsored by the NCRST-Infrastructure consortium and the Vehicle Intelligence and Transportation Analysis Laboratory (VITAL) at NCGIA, which are funded by the U.S. Department of Transportation (Research and Special Programs Administration), NASA Applications Division and the California Department of Transportation (Testbed Center for Interoperability). Space is limited. Preference will be given to papers or software demonstrations that best reflect the focus of the meeting. By Monday, June 11, please fill out a Registration Request (now disabled) and enter a 100-word abstract. This applies whether you are presenting a paper or a demo. If you'd like to attend but not to present, you must still register by Friday, June 15. When you submit the form, wait for confirmation showing that it has been processed by the server. A day or so later you will receive notification by e-mail that the registration request has been received. Abstracts will be reviewed by a Program Committee. In the event that the meeting is oversubscribed and your presentation or attendance cannot be accommodated, you will be notified as early as possible. Abstracts should focus on methodological issues. The only thing you need to prepare for the conference is a Powerpoint-style presentation — there is no need to write up a paper for the moment. A XGA resolution (1024x768) data projector will be provided. Presentation files will be made available on the web following the meeting. Based on group consensus, we may invite participants to write full length papers for publication in a refereed volume. Sunday August 5 is the last day of the Fiesta weekend in Santa Barbara. We recommend arrival on Friday August 3 to enjoy the festivities (and maybe to save on airfare). There's also good hiking, snorkeling, people-watching, etc, so bring the family and make a vacation out of it. Note that this is high tourist season, our special hotel rates are not that special on Friday/Saturday, and hotels may prefer to accommodate those who book both those nights rather than one. Book early! 1450 Where have we come, where do we go from here? 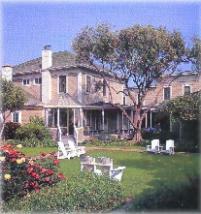 The Upham is a charming Victorian (1871) bed & breakfast in the heart of downtown. Fare includes continental breakfast, afternoon wine and cheese, and milk and Oreo cookies at bedtime. You'll be in fine company in the guest book — alongside Agatha Christie, Aldous Huxley and Richard Nixon. Be sure to mention CLEM2001 to get the meeting rate ($96/night), which applies for the nights of Sunday August 5 thru Tuesday August 7 only. For Friday and Saturday nights the rates are $150-225/night — the $225 end gets you a fireplace and Nixon's initials indelibly inscribed on the bedpost — and CLEM2001 attendees get a 10% discount on those numbers. You could explore other hotels (e.g. Tiffany Inn, El Prado Motor Inn) or nearby towns (e.g. Solvang) on those nights. 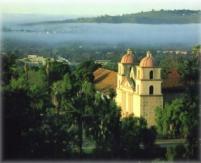 Santa Barbara (SBA) is connected by direct flights from Los Angeles, San Francisco, San Jose, Las Vegas, Phoenix and Denver. Principal airlines are America West, American and United. Or you could drive from Los Angeles — about 90 minutes. Travel options and orientation can be found at VITAL's Santa Barbara gateway. De La Vina is the 3rd right (SE, one-way).